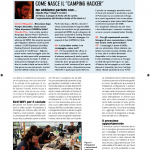 Su Internet Magazine di settembre è uscito un articolo sul Wireless Battle of the Mesh v3! Il pdf si può scaricare da qui. This entry was posted on Saturday, October 2nd, 2010 at 3:10 pm	and is filed under Uncategorized. You can follow any responses to this entry through the RSS 2.0 feed. You can leave a response, or trackback from your own site.